I am Zohaib from Bhagalpur. 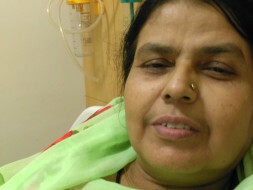 My mother, Mrs. Farhat Perween has been diagnosed with a cancer named, Mesothelioma. This is a very rare and aggresive cancer. My father Syed Md Ziauddin, is a pensioner and a recovering angioplasty patient. He retired from The Accounts department, Bhagalpur University, Bihar. He underwent his sugery four years ago in Delhi. I am working in Tata Consultancy services, kolkata and have joined work after my engineering about two years ago. I have also just managed to pay off my educational loan this year. My mother is getting treated by Dr. Sanjoy Chatterjee at Tata Medical Center , Kolkata. She underwent her fourth chemo therapy on 11th july. We have spent whatever we had anf now we are in need of money to keep the treatment on. I contacted world's best doctor in the treatment of this cancer, mesothelioma. His name is Dr Paul Sugarbaker from Texas, USA. He said there is no cure for this cancer. And his organization has sent me an estimate of approx 16 cr INR. It was just impossible for us so we started the treatment in kolkata itself with whatever fund we had. But now, we are in need of fund after four cycles of chemo. I will strictly use all the funds in my mother's treatment. Her next visit is on 01st Aug. Any help from anyone would be highly appreciated. I am starting this fund raising with lots of hope. I hope people will come forward to help us.